It’s time to celebrate, the new seasons crops are ready. The first new crops of the season are extra special. I’ve waited all winter to taste fresh new growth. The plants themselves have sat throughout the winter months, taking a battering from the weather – be it rain, snow, wind or frost, and yes some weak rays of warmth from the sun. 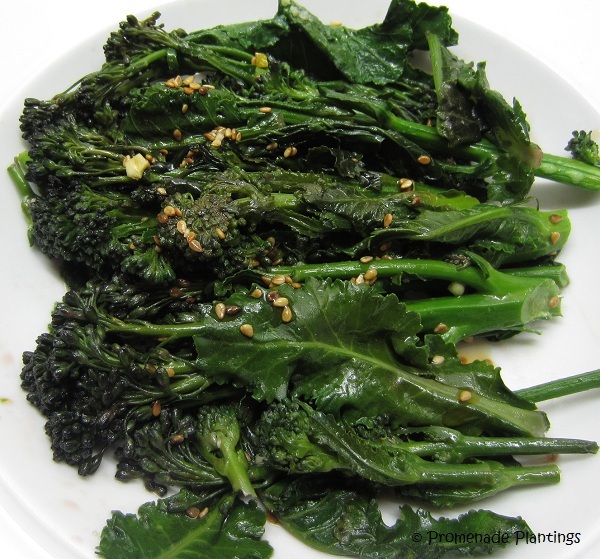 And what better way to celebrate than with Purple Sprouting Broccoli. The seeds were sown in late April last year, planted out sometime in May and have weathered neglect marvellously. This year I grew some under the Climbing French Beans, a suggestion I picked up from a gardening forum. It worked – the pigeons couldn’t get to the plants, what is it about Pigeons and their love of greens? And the usual caterpillar damage and white fly infestations that are often a problem here, simply didn’t happen. 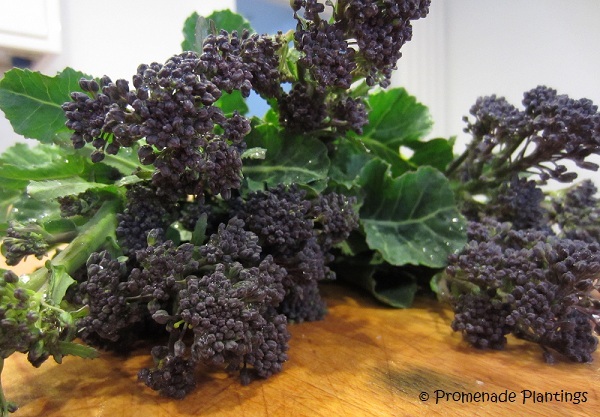 I spotted the first signs of the tender stems of Purple Sprouting Broccoli in February, but have had to wait till now before I was able to get a proper picking. On Friday I collected a carrier bag full, too much just for me, friends were invited and before I knew it we had a splendid evening planned with dishes made and brought along, wine consumed alongside plenty of chat and laughter. I love them lightly steamed, don’t boil these babies – there’s no need. You want to cook them so that they still retain some crunch. A few minutes is all it takes. When cooked they are the deepest green you can imagine, almost black in colour. I’m convinced you can taste the vitamins and iron! We ate them plain with butter and salt and pepper. They have a delicate flavour and don’t need anything fancy. Dressed with anchovy butter is divine, but one of my favourites is to have them mixed in with some Spaghetti aglio, olio e peperoncino. I got lucky, there were leftovers, a rarity in this house. So I had them cold the next day, dressed with an Asian Style Vinaigrette of soy, rice wine vingear, lime juice, garlic, chilli and some toasted sesame seeds. Bliss! They are in the ground for a long time, getting on for a year, but with careful planning and planting they don’t take up too much room. And those first tender stems are worth the wait! It will soon be time to start sowing again…..
Divine darhling (always makes me think of Ab Fab!) Have you thought of getting/making a polytunnel? Or would that not work for you out there in flat land with wind raising the roof? Love the anchovy butter sugestion! It’s one of the few greens I seem to manage to grow – cabbages get mullered by slugs, cauliflowers bolt. But the PSB seems to do just fine. And phew you can get some locally – it’s grown commercially in Kent and Sussex, but is very expensive, I’m told one of the reasons is that it has a short shelf life the other being that they can’t mechanically pick it. But it is tasty! Beautiful broccoli! I’ve been missing broccoli and green beans, but we will have them soon. I like the sound of your Asian marinade and I love broccoli thrown into cooking pasta for the last thirty seconds. I know what you mean about missing certain fruit and veg. I saw the red currants and blueberries now have some teeny shoots on them, a sure sign of summer food to come! To true Mandy, and I know I’m lucky to be able to do so! Gorgeous – my mum and dad will be especially jealous! So where are you now then, I can´t keep up?! Boing! Back in the Uk for a few days, then back to Fance for a few more, then back again…. Boing said Zebedee!! I’m doing my bit for greenhouse emissions…… NOT! Thank you Nia, there is something special about Spring vegetables. This looks wonderful Claire. Like you, I’ll take my broccoli with pasta aglio e olio, thank you very much! If I ever get a place with more space for a garden, broccoli will surely get a spot, no doubt about it. Morning Claire .. oh, this looks absolutely delicious!! and how nice that they can’t be harvested by machines. A peaceful way to grow a nutritious crop. Ok, I’ll have to find some seeds and plant some of this broccoli. p.s. how do you put your name on the photos? I’d like to do that also. Hi Claire .. yes I do resize them .. ok, thanks, I’ll try that with my pics!! I’m so jealous of you gardeners!! At least I can share in your harvest virtually! I’d enjoy these as well with the pasta; that’s one of my favorite dishes. And your leftovers sound just as good!! Happy gardening Claire! Hopefully one day you will have a garden, and hopefully soon! Purple broccoli! Now that’s something we haven’t tried yet, but we do have quite good luck with growing broccoli in general, although none of this year’s have yet formed heads. We’re trying to grow romanescu for the first time too! Enjoy your crop – it’s such an amazing treat to be able to eat produce that’s freshly harvested, especially when there are friends to share it with! This is the sprouting kind it comes in either white or purple, and is different to the standard broccoli grown, But if you can grow standard broccoli then go for it! And I’ll look forward to hearing about the Romanescu, not something I’ve tried yet. I wonder if it is easier than cauliflowers – I’m not very successful with those……. Nothing better than fresh veg from your own garden! You’re very lucky to have such a successful crop. Every bit of something green & edible that I plant goes to the birds, or bugs, or monkeys in my garden! Monkey’s aren’t something I have to contend with here 🙂 not sure how I’d manage if I did, it’s bad enough dealing with the usual pests without added “interest” !! You are making me feel positively delinquent! I planted a section of onions and garlics and they are sprouting wonderfully, and today I put in peas, lettuces, spinach, radish, turnips. and beets. The weather here is too warm, and I hope it cools back down a bit, or all of my work will be for naught. But seriously, I am happy for your success! Bring on the delinquency I say!! The thought of peas, lettuce, radish – all the summer goodies. YUM. And thanks for the compliment Lynda, as I’m sure you know with gardening, not everything works out to plan! Broccoli is my favorite vegetable hands down. I’ve never had purple, but it’s so pretty. And now I must try it with pasta aglio e olio! I’d definitely recommend it with the pasta – it’s perfect, and takes no cooking, simple and tasty! Thanks Kevin as always it’s a pleasure to share! Hi Tandy, they are delicious to eat, and for me and easy crop to grow – they don’t need a lot of fuss and attention – always a bonus in the garden! so tasty and full of goodness! we are still picking broccolini, so no down time for us this year, the new plants are almost ready to fruit …or they would have been if a few kangaroos did not get in and have a browse! 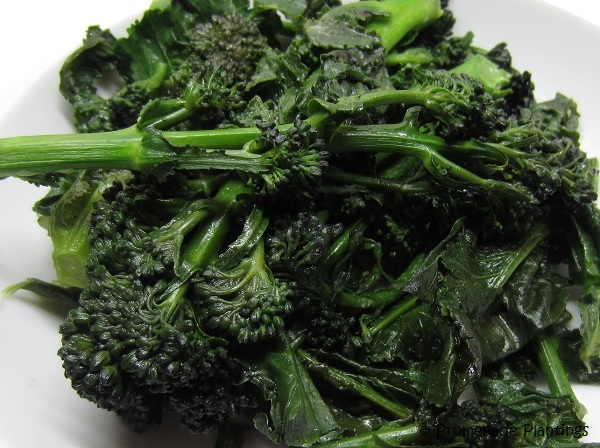 I must look out for broccolini, it sounds good. And tut tut to the naughty kanagroos! But I gues sthey just think, oh how nice someone has set up some lovely fresh shoots for us to eat!! How green and delicious. Spring came quick here as the weather abruptly changed over the course of a weekend. us to, the weather is wonderful at the moment – bright blue skies and warmth…. ahhhhhhh it feels good to be outside! Getting the first items from the garden is always so exciting. Alas it will be months for us, but I am getting excited! It is a great feeling, and it’s a real sign that even more food from the garden is on it’s way! Yay–a gardening post! I have been waiting all winter for your wonderful gardening tips. Maybe by the end of this season you will have helped me turn from a “not very green thumb” gardener to a “fairly competent” gardener. 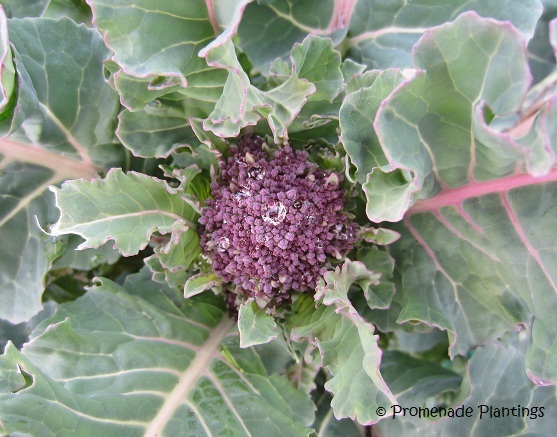 I am definitely going to try the purple broccoli for over-wintering next yearll those pictures look SO good. 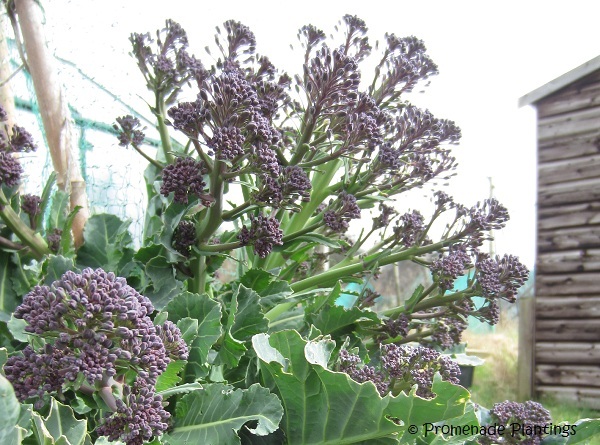 I just love that you can grow purple sprouting broccoli!! That is so awesome, pretty and I bet it tastes incredibly fresh prepared just how you’ve done it! Hi Smidge, yes it is wonderful. I swear you can get a real vitamin and mineral hit just looking at it, let alone eating it! Way beauteous broccoli! Have never tasted straight from the ground, but I’m making an honest effort to imagine how fabulous that would be! Traveling between France and home must be so nice. You get to visit with your friends, check on your garden and then take lovely goodies back with you. I’ve been a bot lazy about taking things back with me, but my next trip is definitely one for Nougat, the French make wonderful Nougat, and several friends will be very happy I think to be able to snack on this sweet treat. Exciting! I sowed some myself in early October, and here I was thinking ” early” would get me to harvest time before the heat set in for good. (84°F the last three days already…) Perhaps if I start some inside here early May to get a head start? It is warm – it makes us concerned for the coming summer. Last summer was record-setting hot and dry. We’ll have to see. I was thinking I’d start them indoors in order to avoid the heat. We start hitting 100 degrees Fahrenheit here in May, stay in the 90s most days when its not 100, and don’t regularly drop out of 90-100 until the end of September. Do you think that would work? Start indoors (to get the 75 degree AC temps) and then put out as seedlings at the start of October when it’s only in the 80s? Ah, I see what you mean now about starting them indoors, that makes much more sense to me now! We’ve had some very dry years here too, and we have a hosepipe ban coming into force any day now as the reseviors are very low, it just means as a gardener I need to mulch, mulch, mulch!